Niki Terpstra successfully held off a strong chasing group to take a solo win in Wednesday’s Belgian semi-classic, Dwars door Vlaanderen. Terpstra (Omega Pharma-QuickStep) broke free with Jelle Wallays (Topsport Vlaanderen) just before the Paterberg, 30 kilometres from the line in Waregem. However, Wallays was unable to keep pace with a storming Terpstra, and was soon dropped. Terpstra’s Omega Pharma-QuickStep team-mate and 2008 winner Sylvain Chavanel came home in second, with Koen De Kort (Project 1t4i) in third. Chavanel had sat tight in the chasing group, unwilling to work in bringing the gap down on his team-mate up front. When De Kort launched a late attack, Chavanel followed, closed him down and took second place on the line. Despite some effort from the bunch to reel the break back earlier in the day, they collectively failed to regain contact as the 200km race worked its way through 13 punishing Belgian bergs. 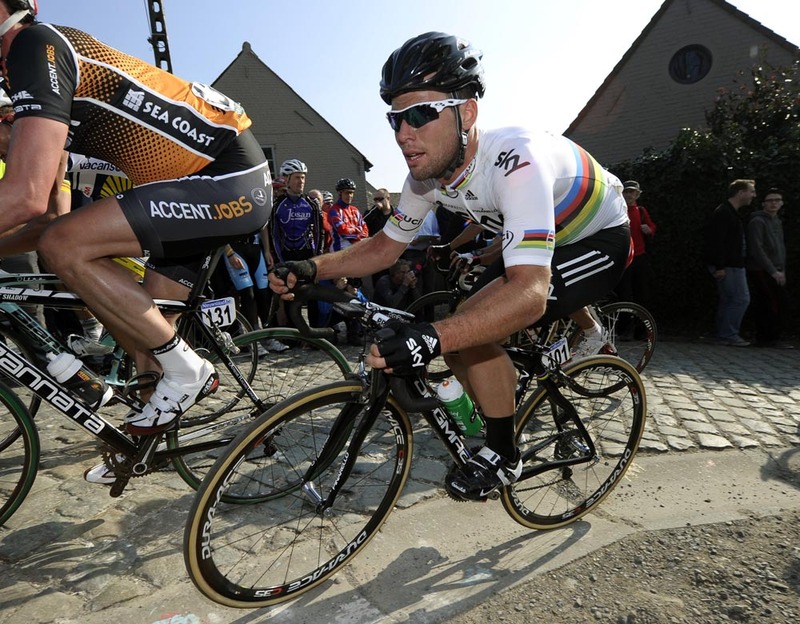 World Champion Mark Cavendish was a late addition to Sky’s roster at Dwars door Vlaanderen as he prepares for Sunday’s Ghent-Wevelgem. The Manxman Tweeted after the race that he crashed hard in the final 15km as a result of another rider throwing a bottle into his front wheel. An event over which he expressed a certain degree of unhappiness.